The offshore communications company got caught up in the oil price rally. What: Shares of RigNet (NASDAQ:RNET) jumped on Friday, closing exactly 10% higher. Fueling its rally was the jump in oil prices, after crude closed up 6.4% to just under $40 a barrel. So what: Crude oil spiked last week, closing up 8% on signs that fundamentals within the global oil market are improving. 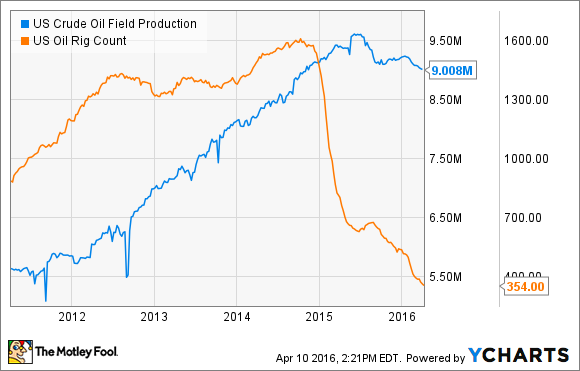 U.S. oil production is expected to continue to decline because of the resumption of the decline in active oil rigs. According to an update by Baker Hughes (NYSE:BHI), the oil rig count fell for the third straight week and is now down to just 354 active rigs, which is 50 less than this time last year and well off the peak before oil prices crashed. With fewer and fewer rigs working, it is virtually impossible for U.S. oil producers to maintain their current production rate, which clearly peaked and has started to decline. In addition to sinking production in the U.S., oil production at other large global producers appears poised to be frozen at its January level. At least that's if a proposed production freeze between OPEC and Russia goes through. While that freeze has been rumored to be falling apart, major oil suppliers are scheduled to meet on April 17 to discuss the proposal with the market, hopeful that an agreement will be reached. Typically a falling rig count and a production freeze would be bad news for oilfield-service companies like Baker Hughes or RigNet, and in the short term it is bad news. However, it's a longer-term net positive because it should enable the oil market to recovery quicker thus leading to a sustainable improvement in the oil price, which would lead to better activity levels for both companies. It's this hope of better days ahead that fueled RigNet's stock on Friday. Now what: While the oil market seems to be getting better slowly, it still has a long way to go before conditions return to some sense of normality. Further, oil is much too low for oil producers to invest all that much into new offshore oil and gas projects, which is what RigNet needs. Not only that, but even once oil recovers to the level they need, probably in the $70 a barrel range, it still could be a year before they can even commit more capital offshore. That means it could be quite some time before RigNet's financials begin to improve, suggesting that a lot more volatility could be in the cards.